The timeless appeal of the glitter of gold details is one of the distinguishing features of our company. Small details make such a difference and our mission to perfect those details is an aspect that we would never forsake. It is important that the quality of each piece is confirmed by industry certifications, but also and above all, by furniture dealers with a true passion for the business. Those who place their trust in Arredoclassic understand this and appreciate the precision of furniture produced using standardised processes but carefully managed by the able hands of those who are highly skilled within their field. 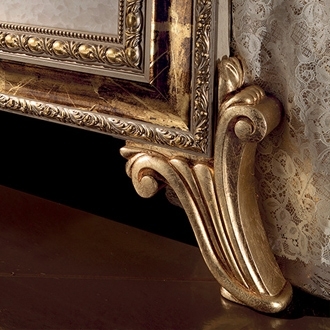 Our furnishings contain a small part of every single one of them, from the office workers to the warehouse staff, from those responsible for the fabrics to those applying the gold leaf. One of the most fascinating processes is the application of gold leaf, an artisanal process performed with the help of skilled craftsmen who put their precious tools to work in our company’s workshops. This process is put to good effect in our Raffaello, Giotto e Donatello collections. 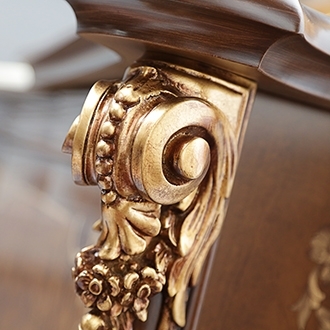 Gilding through the application of gold leaf is an age-old decorative method that has its roots in the noblest tradition of artistic furniture. Aside from technological advances in the application of material that is less liable to deteriorate and can therefore offer a higher degree of reliability compared to processes used in the past, the procedure has remained pretty much unchanged. The first step is to polish and clean the surface to be gilded, so that it can evenly absorb the layer of adhesive that the gold leaf will be laid on. 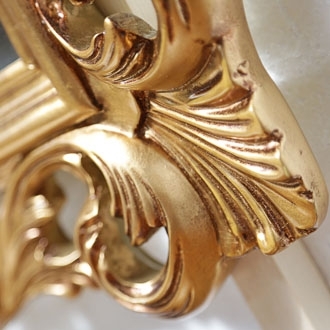 The adhesive is applied with a brush, as this makes it possible to ensure that even the smallest of details has absorbed the amount needed to allow the gilding to adhere perfectly. The gold leaf is then applied in small sections, ensuring that the surface remains smooth and even. Once dry, the gilding is cleaned and a protective coating is applied to ensure its shine remains unaltered over time. The piece is then ready for painting and the final finishes. The true beauty of Made-in-Italy lies in these steps; history is linked with innovation and traditional processes use advanced technology to create contemporary shapes arising from and inspired by a centuries-old tradition.